For today’s glamorous video I’m featuring behind the scenes footage! Miss Lillian Rose, Miss Mon Mon, Miss Veronica Lily, and I are headed out to Hyde Park for a fabulous shoot with Daniche Creative. It was the perfect summer’s day for a vintage picnic with friends. We had the most fun catch up and capturing some incredible images. Photos will be shared in the very near future. Be sure to subscribe to my channel to never miss out on a video, they’re released every Tuesday, Thursday and Saturday. 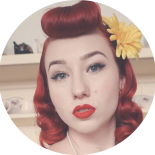 This entry was posted on January 19, 2019 by Miss Lady Lace in Uncategorized and tagged 1940's, 1950's, blogger, glamour, miss lady lace, miss lady laces pinup blog, perth, perth pinup, perth pinup blog, perth pinup community, pin up, pinup, pinup blog, pinup blogger, pinup fashion, pinup girl, pinup life, pinup lifestyle, pinup perth, red lips, retro blog, retro girl, retro glamour, the perth pinup community, victory rolls, vintage, vintage blog, vintage blogger, vintage fashion, vintage girl, vintage glamour, vintage perth, vintage pinup blog.